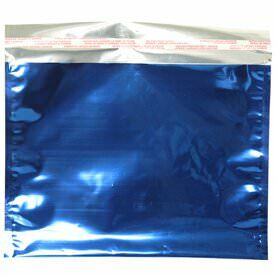 Electrify your envelopes with our blue electric foil! These 6 1/8 x 9 1/2 Booklet Envelopes are sure to bring that extra shine and intensity you've been searching for. Instead of the standard paper envelope, why not mix it up with our Blue Foil Envelopes? The foil material will keep all of your documents undeniably protected from wear and tear! You don't have to worry about your invitations, letters, work papers, or anything else to be harmed. 6.125 x 9.5 Blue Envelopes are a great size for fitting index cards safely, along with smaller notes from class. And the blue foil will surely keep your attention, even in all the clutter of your home or office desk. This envelope also features a peel and seal closure for easy closing. All you have to do is peel and seal and you're ready to send it off! Blue Foil Envelopes measure in at 6 1/8 x 9 1/2 and feature a self-adhesive closure. They come in a standard classic blue foil.